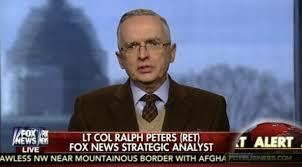 Sierra Sentinel News- Serving The Sierra Nevada Communities: Colonel Ralph Peters quits FOX's "propaganda machine"
voices to a mere propaganda machine for a destructive and ethically ruinous administration." Peters accused them of fueling paranoia an serving as a 'propaganda machine' for the Trump administration. He wrote these things in his letter of resignation.